Women always ask the same question – “Why does my man lie to me that he has a work thing when clearly he is not at work!” Then a follow up statement ensues – “He is cheating on me!” Oops, miss, hold your horses. A lying man is not always a cheating man but there is great likelihood that he is. It is not a 100% foolproof reason though. Men lie for a variety of reasons. What women believe to be shallow is a very valid reason on why men lie. The root of it all is fear. They lie because they fear the outcome of telling the truth. So to avoid “problems” due to “honesty”, men tell a little (or big) white lie so that they are no more issues afterwards. And no matter how forceful women are about communicating to a man – “Tell the truth, always, please, even if it hurts!”, they are not born that way. This is what women have to understand in order to have a sane life. Stressing about why men lie is a wasted energy. Now, I have interviewed 9 men of different backgrounds in life who told me the main reason (for them) as to why they lie to the woman they love. Bear in mind: LIE TO THE WOMAN THEY LOVE. It means that a lying man loves their woman very deeply but can still manage to lie. So it is not about not loving their wife, partner, or girlfriend. They also lie to their mother, sister, cousin, aunt, friend and the list goes on. They are just being coward men. The sad fact is that, men lie because they are born that way. They cannot help it. To those who can, they have practiced the art of honesty and in reality, the statistics of honest men is one out of one million. Seriously. Moving on, here are 3 common reasons these nine men told me, more or less. I have taken the three vividly explained answers to me and I am attempting to make all women understand why their men lie so they can do something about it! Men think differently. It is always compartmentalizing things – Win or lose. Victory or defeat. Good or bad. And lying is good if hurting is bad. Lying is winning when if hurting is losing. They do not want tears. And with that, with lying, they can sleep at night because they know that you are sleeping well too. Men are not good at being emotional. It is a struggle for them. Women, on the other hand, are emotional beings. So it is very easy to cry and talk about almost anything dramatic. You have to understand that men are never going to be that way but they do deal with their troubles and pains in another way – a way women will never know. Now, to avoid dramatic encounters, they just lie. They want an easy life, not a life filled with pains. Crying is pain. Oh well, pride. Men are perceived to be so strong – the knight in shining armor. But they are just human. Even they themselves fail to see it and they deny their shortcomings in character and abilities. Again, this is a “man” thing. They will rather lie to women than to let them see who they really are which is sad. 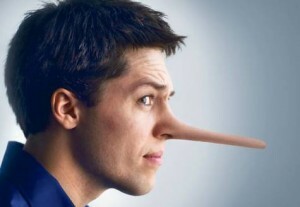 So here are 3 common reasons on why men lie. As women, we may not like it. As men, we say, “Yes, that is me!”. But a lie is still a lie. Even if you commit it for the right reasons, it will always bite back at you. Lying will create a lot of troubles for you in the future.